It’s perhaps the most famous of the visits that Jane Austen made during her London stays and while the property no longer exists, we thought it was worth mentioning. But first, let’s explain. The Prince Regent (later King George IV) was an admirer of Jane’s novels, so much so that when he was aware of the author’s presence in London, he issued – via his librarian and chaplain Rev James Stanier Clarke – an invitation for her to visit the library and tour his palatial London property, Carlton House. The grand, lavishly decorated property, created from an existing property between 1783 and 1812 by the architect Henry Holland, was among the grandest in London at the time. Facing on to the south side of Pall Mall, the building sat across what is now Waterloo Place while its gardens abutted St James’s Park. Jane visited on 13th November, 1815, and in the company of Rev Clarke toured the library. During her visit, it was suggested she could dedicate her next novel to the Prince Regent, an idea which didn’t sit that well with Jane who was a supporter of his estranged wife, Princess Caroline. After her initial equivocation, her publisher John Murray apparently managed to prevail upon Jane to do so and she eventually capitulated, dedicating her novel Emma to him (a special copy of the novel was sent to the Prince at Carlton House). Carlton House, meanwhile, didn’t last for much longer. King George IV, on his accession to the throne, decided to create a property more fitting for a king and ordered works to be carried out on Buckingham House so it could be his main London residence (as Buckingham Palace). Carlton House, despite the exorbitant sums the Prince had spent transforming it, was demolished in 1825 and the John Nash-designed Carlton House Terrace built upon the site. Columns from the Carlton House were reused in creating the portico of the National Gallery on Trafalgar Square. PICTURE: Carlton House (via Wikipedia). Facade of New Schomberg House at number 80-82 on the south side of Pall Mall. 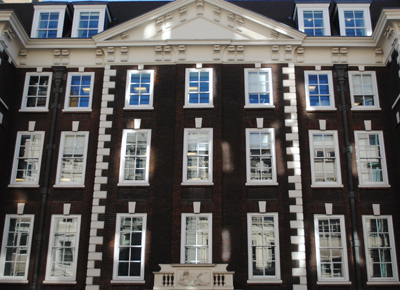 While the rest of the building dates from the 1950s, much of the facade from what is now known as Old Schomberg House (among numerous buildings in Pall Mall once occupied by the War Office) was retained and the eastern end restored. The house was originally built in the late 17th century for the Duke of Schomberg, a general in the service of King William III (hence the name), and replaced Portland House on the site. Later residents here included the painter Thomas Gainsborough, who lived here between 1774 until his death in 1788. • All 100,000 tickets for London’s New Year’s Eve fireworks are now booked, the Greater London Authority announced this week. They’ve advised those without a ticket to avoid the area around Embankment and South Bank on the night, saying that the best alternative view of the fireworks will be live on BBC One. Meanwhile, don’t forget the New Year’s Day Parade which will kick off in Piccadilly (near junction with Berkeley Street) from noon on New Year’s Day. The parade – which takes in Lower Regent Street, Pall Mall, Trafalgar Square and Whitehall before finishing at 3.30pm at Parliament Square in Westminster – will feature thousands of performers. Grandstand tickets are available. For more, see www.londonparade.co.uk. • The National Gallery has acquired French artist Jean-Baptiste-Camille Corot’s work, The Four Times of Day, it was announced this month. The 1858 work, acquired with the aid of the Art Fund, has something of a star-studded pedigree – it was bought by Frederic, Lord Leighton, in 1865, and the four large panels were displayed at his London home until his death. In the same family collection for more than a century after that, they have been on loan to the National Gallery since 1997. They complement 21 other paintings by Corot in the gallery’s collection. The Four Times of Day can be seen in Room 41. Entry is free. For more, see www.nationalgallery.org.uk. Exploring London is taking a break over Christmas, so this will be the last This Week in London update until mid-January. But we’ll still be posting some of our other usual updates including our most popular posts for 2014 round-up! The adventurous, wealthy and rather mysterious Phileas Fogg, the hero of Jules Verne’s 1873 novel Around the World in Eighty Days, is noted in the book’s first line as living at “No. 7 Saville Row, Burlington Gardens, the house in which Sheridan died in 1814”. It’s from there that he and his delightfully named French valet, Passepartout, set off on their breakneck trip around the world after Fogg, a “doubtful” Londoner who was a member of the Reform Club based nearby in Pall Mall (“and that was all” – his history was something of an unknown), makes a £20,000 bet that he can travel around the world in just 80 days – a bet which sees him travel by everything from trains to elephants and overcome all sorts of obstacles as he attempts the feat. But back to London and Savile Row in the inner west London area of Mayfair. The Irish-born playwright and MP Richard Brinsley Sheridan did indeed live in Savile Row – but at number 14 rather than at number 7 (and he died in 1816, not 1814 as claimed in the book). There is a plaque on the townhouse mentionig Sheridan’s residence (but not Fogg’s) which today is occupied by tailors Hardy Amies. Amies himself purchased the property, which was restored in 2009, in 1947, reportedly with the backing of Cary Grant’s ex-wife, actress Virginia Cherril. 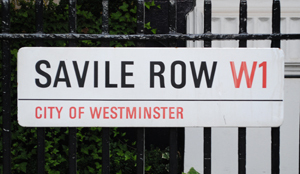 For more on Savile Row’s history, see Henry Poole: Founders of Savile Row – The Making of a Legend. A quiet square at the heart of the area known as St James, the square’s origins go back to the 1660s when King Charles II granted what was initially a lease (and later the freehold) over a section of St James’s Field to Henry Jermyn, a favourite of King Charles I’s queen Henrietta Maria who was created the 1st Earl of St Alban. The earl began developing the residential square (the original design had houses on the south-side fronting onto Pall Mall) and, thanks to its proximity to Whitehall and St James’s Palace, quickly attracted some of the who’s who of London to live there. Indeed it’s said that by the 1720s, seven dukes and seven earls were in residence in the square – other residents included PMs William Pitt the Elder and William Gladstone (both lived in Chatham House, at numbers 9 and 10, albeit at different times) as well as two of James II’s mistresses, Arabella Churchill and Catherine Sedley, who apparently lived at number 21 in the late 1600s. Among the architects who designed houses around the square were Robert Adam, Sir John Soane, and, in more recent times, Edwin Lutyens. The square – which reached its final layout, designed by John Nash, around 1854 – remained a desirable place to live even as in the 19th century, some of the houses gave way to financial institutions, private clubs, offices and even lodging houses. These days it’s dominated by business and other institutional organisations. Organisations located in the square today include the Naval and Military Club (number four – former home of Nancy Astor), the East India Club (number 16) and the London Library (located at number 14, it was founded by Thomas Carlyle in 1841) as well as the international headquarters of BP. 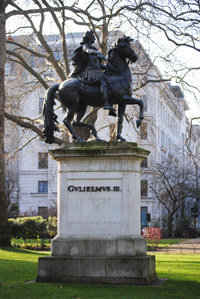 The gardens feature an equestrian statue of King William III at their centre (the work of John Bacon Sr and Jr, it was installed in 1808 and is pictured above). Other monuments include The Stag (located in the south-west corner, it is the work of Marcus Cornish and was installed in 2001) and, just outside the garden railings in the north-east corner, a memorial to WPC Yvonne Fletcher who was killed when a gun was fired from the Libyan Embassy (known as the Libyan People’s Bureau, it was located at number 5) during a demonstration on 17th April, 1984. The pavilion on the south side was designed by John Nash. The gardens are private – managed by the St James’s Square Trust – but open to the public on weekdays from 10am to 4.30pm. Following our recent article on John Nash (see the earlier post here), we’re taking a look at one of his projects as part of our series on London’s oldest. Built between 1816-18, the Royal Opera Arcade – which features a series of shops running down the side of a covered central hall – is not only the oldest existing shopping arcade of its type in London but apparently in the world. 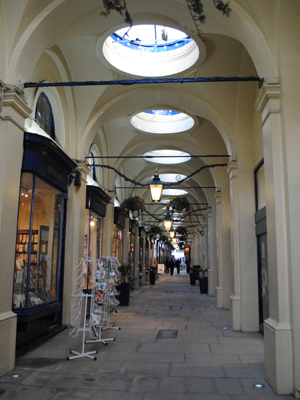 The 12 foot wide covered arcade was built on the west side of what was previously the Royal, King’s or Haymarket Opera House – Nash and George Repton completed the exterior of the property originally built by Sir John Vanbrugh at the same time the arcade was built – but is now the site of Her Majesty’s Theatre (the former theatre was destroyed in a fire in 1867). It extends between Pall Mall and Charles II Street in the West End, running parallel with Haymarket. Burlington Arcade, frequently cited as the city’s oldest, was in fact completed a year later. The arcade originally had 19 shops – each with a cellar and mezzanine level – running down its west side. It now features shops which sell everything from fine wines and art to books and sandwiches. For more on the Royal Opera Arcade, see www.royaloperaarcade.com. Perhaps now best known as the most prominent of the many mistresses of King Charles II, Eleanor ‘Nell’ Gwyn – currently subject of a new exhibition at the National Portrait Gallery – was a renowned actress in the years after the Restoration, known for her wit and beauty – “Pretty, witty Nell “as diarist Samuel Pepys called her. Gwyn’s (variously spelt as Gwynn or Gwynne) origins remain something of a mystery – believed to have been born around 1651, her parents remain something of a mystery (some have suggested a Cavalier, Captain Thomas Gwyn, as her father) as does the place of her birth, variously claimed to be London, Hereford or Oxford – one source from 1715 claims she was born in Coal Yard Alley, off Drury Lane in Covent Garden. Ascribed as having various jobs during her childhood – everything from helping at a bawdyhouse to a street vendor or cinder girl – around 1663, she was working as an “orange girl” at a theatre then known as the King’s Theatre in Bridge Street (now the site of the Theatre Royal Drury Lane). She clearly made an impression for a year later she was working as an actress and is believed to have taken prominent actor Charles Hart as her lover. It has been suggested her first recorded stage appearance was in March, 1665. She wasn’t viewed as a brilliant dramatic actress but instead came into her own in comedies where her wit, as well as her beauty, could shine. 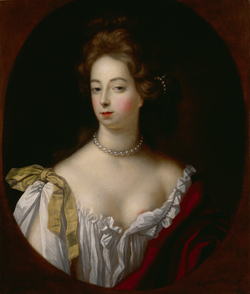 Having already been known to have had at least two lovers – Charles Hart and aristocrat Charles Sackville, Lord Buckhurst – by 1667 George Villiers, Duke of Buckingham, had decided to bring her to the attention of the king as a possible new mistress and so increase his influence. By 1668 or 1669, Nell is believed to have succeeded in this, joining the growing number of women who could claim the title (Charles II ended up having at least 12 children by his many mistresses). Her acting work gradually decreased and in 1670, she gave birth to Charles, her first son and believed to be the king’s seventh illegitimate child. She briefly returned to the stage in 1670-71 before retiring from the theatre for good. In February, 1671, Nell moved into a townhouse at 79 Pall Mall (she was granted freehold of the property five years later and the property, which still stands, remains the only one on the south side of Pall Mall not owned by the Crown) and in December, she gave birth to her second child by the king, another son James (he died in Paris while attending school there 10 years later). Both sons were given titles – Charles was later named Duke of St Albans – and given the surname Beauclerk. In the 1670s, Charles granted Nell Burford House in Windsor where she resided when the king was resident there. In the 1670s, Nell – who continued to maintain her friendships with the likes of Villiers – successfully fought off several rivals for the king’s affection and by the 1680s, her position as the king’s mistress was not in doubt. It was during this period that the story goes when her coach was mistaken by an angry to be that of the unpopular Duchess of Portsmouth, she put her head out the window to tell them “Pray good people be silent, I am the Protestant whore”. When King Charles II died on 6th February, 1685, he left instructions she was to be looked after – his brother King James II both paid her debts and continued to pay her an annual pension. Nell died less than three years later – still only aged in her thirties – on 14th November, 1687, have suffered strokes in previous years. She was buried in the church of St Martins-in-the-Fields. Gwyn is seen as a key figure in London during the period after the Restoration and a symbol of the hedonism of the court of King Charles II, and her rise from apparently humble origins to the royal court has been the subject of numerous books, plays and films. Gwyn is currently featured in an exhibition currently being held at the National Portrait Gallery: The First Actresses – Nell Gwyn to Sarah Siddons. The exhibition runs until 8th January (an admission charge applies). For more information visit www.npg.org.uk. 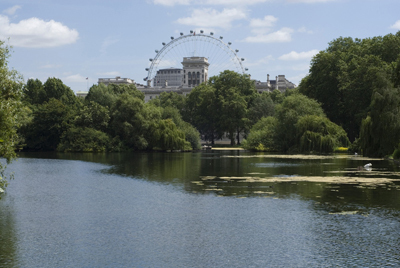 The fourth in a line of parks stretching from Kensington Palace to Westminster, St James’s Park largely owes its foundation to King James I. Given its early history is covered in our earlier post, we’ll skip forward to the time of King Charles II when, under to instruction of Frenchman Andre Mollet, the park was redesigned with new landscaping including wide lawns, avenues of trees and a wide, centrally positioned canal. It was King Charles II who also opened the park up to the public (he even mingled with them there along with his mistress Nell Gwynn). Interestingly the first pelicans were also introduced to the park around this time when the Russian ambassador presented a pair of pelicans to the king. In the 18th century, Horse Guards Parade was added to the park by filling in one end of the park’s canal and was later used for parades. The ceremonies of Beating Retreat and Trooping the Colour are still held there today. The next major changes came in the 19th century when in 1827-28, architect John Nash oversaw a more romantically inspired renovation, including the transformation of the canal into a natural looking lake and the addition of winding paths, as part of his grand scheme which still shapes much of London today. It was also at this time that The Mall (which like Pall Mall takes it name from the game of Pelle Melle – see our earlier post) was transformed into a grand processional route (it was opened to traffic later, in 1887). The park, bounded to the west by Buckingham Palace, also takes in the Queen Victoria Memorial – completed in 1914 to replace the Marble Arch which was moved to its current location at the corner of Oxford Street and Park Lane in 1851 – and flower beds which are planted annually with 12,000 geraniums, the color of which is chosen to match the guardsmen’s tunics. Meanwhile, in 1837, the Ornothological Society of London erected a cottage for the birdkeeper (the thatched cottage can still be seen there today and the post of birdkeeper still exists). The first bridge was placed across the lake in 1851 (and replaced in 1951 with the one that now stands there). Little has changed in the 23 hectare (58 acre) park since Nash’s day. Newer facilities include a restaurant and a playground at the western end. • A new statue of former US President Ronald Reagan was unveiled in Grosvenor Square near the US embassy on Monday, 4th July. The 10 foot tall bronze statue of the president, who died in 2004, was unveiled at a private ceremony by the Foreign Secretary William Hague – former US Secretary of State Condoleezza Rice were also among the more than 2,000 people who attended along with current US ambassador Louis Susman (a frail Margaret Thatcher was reportedly too frail to attend). Commissioned by the Ronald Reagan Presidential Foundation, the statue is the work of sculptor Chas Fagan. Its unveiling is one of a series of events marking the centenary of the birth of the former actor turned politician. • Pall Mall and St James Street in the West End were opened to two-way traffic this week for the first time in 50 years. The changeover came into effect last Sunday morning. The roads were made one-way in 1963 under a scheme to deal with increasing traffic in the area. But it has been reopened in the first stage of a £14 million overhaul of traffic around Piccadilly Circus – home to world-famous neon billboards and the Eros Statue. The area is visited by 200,000 every day. • On Now: Eyewitness: Hungarian Photography in the 20th Century – Brassaï, Capa, Kertész, Moholy-Nagy, Munkácsi. This new exhibition at the Royal Academy of the Arts at Burlington House in Piccadilly, organised to mark the Hungarian Presidency of the EU, is dedicated to the birth of modern photography and features the work of Brassaï, Robert Capa, André Kertész, László Moholy-Nagy and Martin Munkácsi. It comprises more than 200 photographs, dating from 1914 to 1989, which usually form part of the collection of the Hungarian National Museum of Photography as well as the National Museum in Budapest and other public and private collections in both Hungary and the UK. Runs until 2nd October. For more information, see www.royalacademy.org.uk. 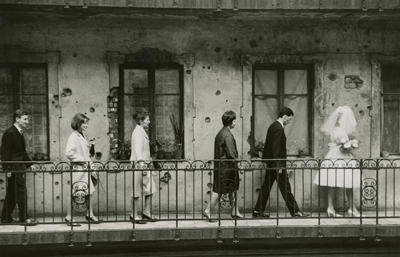 PICTURE: Laszlo Fejes, Wedding, Budapest, 1965, Copyright Hungarian Museum of Photography. • On Now: Shubbak: A Window on Contemporary Arab Culture. London’s first ever celebration of contemporary culture from across the Arab world will feature more than 100 artists involved in 70 events at some 30 venues over the weeks until 24th July. The program includes visual arts, film, music, theatre, dance, literature, architecture, lectures and discussions with many events boasting free admission. Highlights include A Girl in her Room, an exhibition of photo works by highly acclaimed Lebanese/American artist, Rania Matar, at the Mosaic Rooms, one of London’s leading centres for Arab contemporary arts (runs until 23rd July), Shopopolis, a series of collaborations with shoppers at Westfield Shopping Centre (runs until 24th July) and this weekend’s Interference, a series of free films, talks and workshops at the ICA curated by Mathaf: Arab Museum of Modern Art in Doha. For full details of all events, see www.london.gov.uk/shubbak. 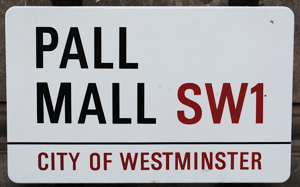 This curiously named street in the heart of London’s St James district traces the origins of its moniker back to the 17th century when the game of “pall mall” (“pell mell” and “paille maille” being among a host of alternative spellings) was played there. The game, mentioned by Samuel Pepys in his famous diary, involves the use of a mallet and ball similar to that used in modern croquet but, according to some commentators, pall mall was more likely a predecessor of golf than croquet, with players attempting to belt the ball as far as possible along a pitch before putting the ball through a hoop suspended high off the ground. Pall Mall, which runs parallel to The Mall from St James’ Street in the west to Haymarket in the east with an eastern extension, Pall Mall East, completing the journey from Haymarket into the northern end of Trafalgar Square, became famous in the 19th and early 20th centuries for housing numerous ‘gentlemen’s clubs’. Among those still in business are the Travellers Club, the Athaenaeum Club, the Reform Club, the Army and Navy Club, the Oxford and Cambridge Club, and the Royal Automobile Club. St James’s Palace sits at the street’s western end and it is of note that nearly all of the southern side of the street is still part of the Crown Estate (the exception being a home Charles II is believed to have given to the actress Nell Gwynne, who apparently sensibly demanded the freehold on the property). Other buildings along the street include Schomberg House, built for the Duke of Schomberg in the late 17th century (only the facade of which remains), and the Sir Christopher Wren-designed Marlborough House, which is tucked in between Pall Mall and The Mall and sits opposite St James’s Palace. The National Gallery and the Royal Academy also both briefly had homes in Pall Mall. • A 9 ft (2.7 metre) tall bronze statue of Air Chief Marshal Sir Keith Park, commander of the RAF in London and the south-east during the Battle of Britain, was unveiled in Waterloo Place, just off Pall Mall, this week. Sir Keith, a New Zealander who joined the RAF after fighting at Gallipoli and the Somme during World War I, was described as the “brain” behind London’s air defences. The unveiling of the statue on Battle of Britain Day (12th September) follows a three year campaign to honor Sir Keith, who died in 1975, with such a monument. A prototype of the statue occupied the Fourth Plinth at Trafalgar Square for six months after it was unveiled in November last year. For more information, see www.sirkeithpark.com. • Spend a night at the museum (well, part of one anyway). The Natural History Museum is opening its doors for one night only as part of European Researchers’ Night on Friday, 24th September. Scientists will be on hand to chat and there will be opportunities to see rare specimens not usually on display including a giant squid. There will also be three bars offering drinks and food. The event, which we can promise won’t include you being chased down hallways by dinosaur skeletons, runs from 4pm – 10pm. For more information, see www.nhm.ac.uk. • Don’t forget! Open House London kicks off this weekend. For more information, see last week’s Around London post.